A typical resin dryer is a carousel or vessel containing modular beds filled with a desiccant material. 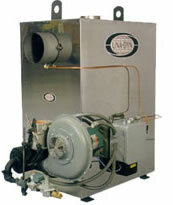 Moisture-laden air enters the dryer through the process air inlet and passes through the desiccant bed. The desiccant bed adsorbs the water vapor, and dehumidified air is delivered through the process outlet. When the desiccant bed reaches a pre-set moisture level, the carousel rotates beds one at a time into the reactivation section of the unit. 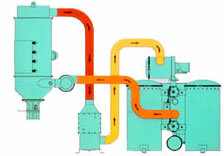 Heated air (electric or gas fired) entering through the reactivation inlet passes through the desiccant to remove moisture and exhaust it into the atmosphere. Positive sealing between the chambers prevents any mixing of the process air and the reactivation air streams. Electric units that process more than 400 pounds per hour are candidates for conversion to natural gas. The conversion consists of replacing the electric heating elements with an external gas burner assembly.